Police cannot invite themselves into a driveway to search a parked vehicle. 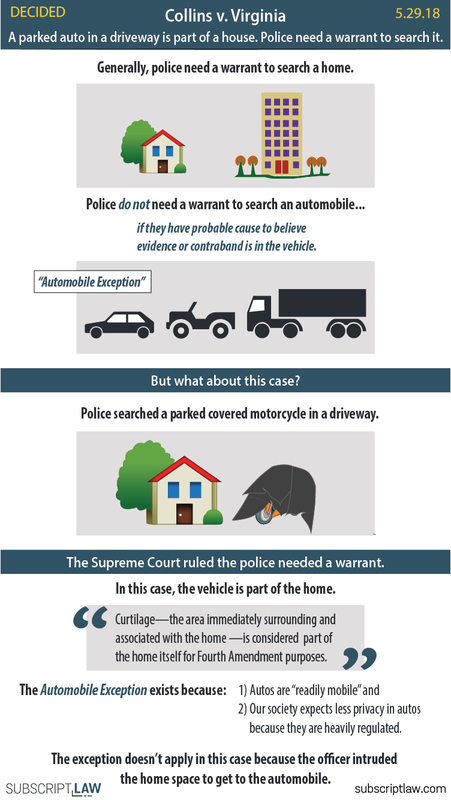 Police get a little leniency from the 4th Amendment when it comes to searching automobiles. That's because autos are "readily mobile," and furthermore, driving is a context in which we expect less privacy, knowing the government highly regulates the roadways. The "automobile exception" is where the confusion in this case came from. The police searched a motorcycle without a warrant, relying on the automobile exception. But in this case, the automobile wasn't on the roads. It wasn't on the move. And in fact, it was parked in the driveway of a home - a place in which we expect the greatest degree of privacy. Don't worry about getting your dictionary because the Court defined the word for us. "Curtilage," it said, is "the area immediately surrounding and associated with the home." And it counts for 4th Amendment protection. The officers in this case invited themselves into a place in which they did not already have access (unlike the roadways, where they generally have access) to get to the auto. That, for the 8-member majority, doesn't get you the automobile exception. Justice Alito dissented from the ruling. He said the 4th Amendment protects people against "unreasonable" search but in this case, the search was entirely reasonable. The automobile exception, he continued, is about the risk that the vehicle could be moved during the time it takes to get a warrant. Because the motorcycle in this case could have been moved easily, the officers were entitled to search it. The curtilage characterization makes difference to Alito; it's about a more general consideration: reasonableness. Here is a link to the opinion.